Excerpt: At first sight, the appearance of a major religion in the history of mankind might seem difficult to describe in anything short of apocalyptic terms. At least, when it is said to have originated with an individual whose life was fundamentally transformed by the revelation of its message, one is obliged to concede that it begins with an apocalyptic experience; if it is further reported to have not just changed his life, but also rendered him the status of a prophet among others, it seems consistent to admit that the same transformation extends to his believers; and if it further said to have inspired his believers to actions of widespread and lasting impact, it is quite tempting to transfer the same description upon the paradigm they have come to represent. Excerpt: We still do not fully understand how the eastern Roman state managed to live through this initial conflict and get past the year 700 – indeed, how it managed to overcome what looks today like quite overwhelming odds. 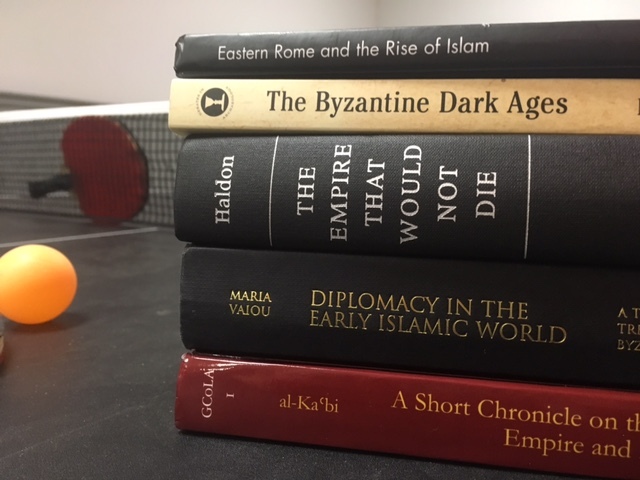 As I noted, there has been a good deal of attention paid to the seventh-century in recent years, with a substantial literature on its many and various aspects. The political events of the period as viewed through the complex written source material, the religious history and conflicts of those years, and the archaeology of the city and of rural settlement have received scrutiny. In reflecting this interest and the scholarship invested in the period and its problems, the present volume goes into the details, the mechanics of survival, to see how exactly is was possible. Arab messengers played a vital role in the medieval Islamic world and its diplomatic relations with foreign powers. An innovative treatise from the 10th Century (“Rusul al-Muluk”, “Messengers of Kings”) is perhaps the most important account of the diplomacy of the period, and it is here translated into English for the first time. “Rusul al-Muluk” draws on examples from the Qur’an and other sources which extend from the period of al-jahiliyya to the time of the ‘Abbasid caliph al-Mu’tasim (218-227/833-842). In the only medieval Arabic work which exists on the conduct of messengers and their qualifications, the author Ibn al-Farr rejects jihadist policies in favor of quiet diplomacy and a pragmatic outlook of constructive realpolitik. “Rusul al-Muluk” is an extraordinarily important and original contribution to our understanding of the early Islamic world and the field of International Relations and Diplomatic History. Excerpt: Physically, the messenger should have a perfect figure and well-built body so the he should not look short or small. Even though it is true that a man should only be judged by what one has in one’s heart and tongue, and what is hidden behind one’s speech. But the way one looks makes an impression before one speaks, and the body hides the mind. A Short Chronicle on the End of the Sasanian Empire and Early Islam: 590-660 A.D.
Excerpt of events from around the year 636 AD: At the time of which we spoke above, once the Arabs subjected all the lands of the Persians and the Byzantiens, they also marched and invaded Bet-Hozaye, subjecting all the fortified cities, that is Bet-Lapat, Karka-d-Leddan, and the fortress of Susa. Susa and Shustra remained (untouched) because they were much fortified, and none of all the Persians remained resisting the Arabs except for King Yazdegerd and one of his commanders whose name was Hormizdan of Medea, who gathered forces and held Susa and Shushtra.